The Crusades war a series o releegious wars sanctioned bi the Laitin Kirk in the medieval period, especially the campaigns in the Eastren Mediterranean wi the aim o recoverin the Haly Laund frae Islamic rule. The term "Crusades" is an aa applied tae ither kirk-sanctioned campaigns focht tae combat paganism an heresy or tae resolve conflict amang rival Roman Catholic groups, or tae gain poleetical or territorial advantage. The term Crusades itsel is early modren, modelled on Middle Laitin cruciatae, an haes in mair recent times been extendit tae include releegiously motivatit Christian militar campaigns in the Late Middle Ages. The First Crusade arose efter a cry tae airms in a 1095 sermon bi Pape Urban II. Urban urged militar support for the Byzantine Empire an its Emperor, Alexios I, wha needit reinforcements for his conflict wi wastward migratin Turks wha war colonisin Anatolie. Ane o Urban's statit aims wis tae guarantee pilgrims access tae the haly steids in the Eastren Mediterranean that war unner Muslim control, but scholars disagree whether this wis the primar motivation for Urban or maist o thae wha heedit his cry. Urban's wider strategy mey hae been tae unite the Eastren an Wastren branches o Christendom, which haed been dividit syne thair split in the East–West Schism o 1054, an establish himsel as heid o the unified Kirk. The response tae Urban's preachin bi fowk o mony different clesses athort Wastren Europe established the precedent for later Crusades. Volunteers acame Crusaders bi takin a public vow an receivin plenary indulgences from the kirk. Some war hopin for apotheosis at Jerusalem, or forgiveness frae God for aw thair sins. Ithers pairteecipatit tae satisfy feudal obligations, gain glory an honour, or find opportunities for economic an poleetical gain. Mony modren Historians hae polarised opinions o the Crusaders' behaviour unner Papal sanction. Tae some it was incongruous wi the statit aims an implied moral authority o the papacy an the Crusades, tae the extent that on occasions that the Pape excommunicatit Crusaders. Crusaders eften pillaged as they travelled, while thair leaders reteened control o much capturt territory rather nor returnin it tae the Byzantines. 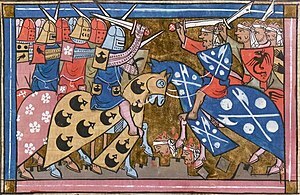 During the Fowk's Crusade thoosands o Jews war murthert in whit is nou cried the Rhineland massacres. Constantinople wis sacked during the Fowert Crusade renderin the reunification o Christendom impossible. The Crusades haed a profoond impact on Wastren ceevilisation: thay reopened the Mediterranean tae commerce an travel (enablin Genoa an Venice tae flourish); consolidatit the collective identity o the Laitin Kirk unner papal leadership; an war a wellspring for accoonts o heroism, chivalry an piety. Thir tales consequently galvanised medieval romance, filosofie an leeteratur. But the Crusades an aa reinforced the connection atween Wastren Christendom, feudalism, an militarism. This page wis last eeditit on 23 Mairch 2017, at 18:01.